Pulmonary stenosis: A narrowing of the pulmonary valve and main pulmonary artery. The aortic valve, which opens to the aorta, is enlarged and seems to open from both ventricles. In this defect, the aortic valve sits directly on top of the ventricular septal defect. The muscular wall of the lower right chamber of the heart (right ventricle) is thicker than normal. These defects cause oxygen-poor blood to be pumped through the body. Children with TOF experience the same symptoms as children with most heart defects: cyanosis (bluing of the skin), fatigue, trouble eating or gaining weight, and clubbed fingers. Children with TOF are at greater risk of endocarditis (infection in the heart), arrhythmia, dizziness, fainting, seizures and delayed growth and development. Children with TOF will need to have open heart surgery. Ideally, a child would have a intracardiac repair within the first year of life. The surgeon will patch the VSD and repair the narrow pulmonary valve and artery. If a child is not ready for an intracardiac repair (premature or underdeveloped artery), surgeons will do a temporary repair called a bypass or shunt between the aorta and pulmonary artery. This helps increase blood flow to the lungs so the baby can grow stronger for intracardiac repair. Many children adopted internationally will either have received no surgery at all or had a shunt procedure. Children who have had an intracardiac repair, generally do very well. However, they will still need to be monitored for complications. Possible complications include a leaky pulmonary valve or restricted blood flow. 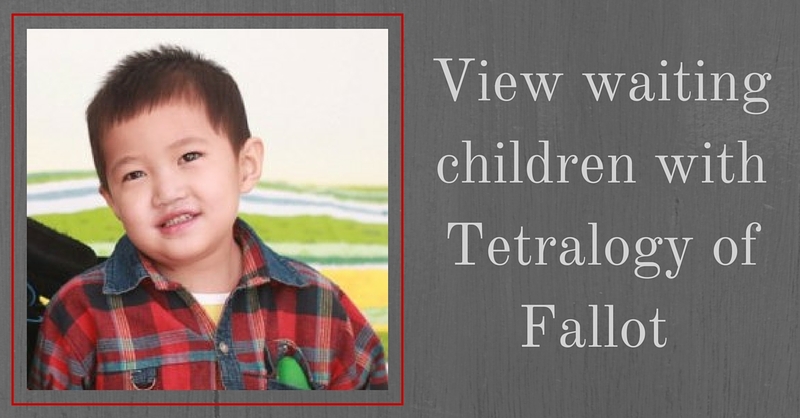 Children with these issues may require an additional surgery or a valve replacement. Prognosis depends significantly on the severity of the defects and how long the child went without corrective surgery.